Take advantage of good weather and take fine dining outdoors with the VonShef 2 Person Picnic Basket. 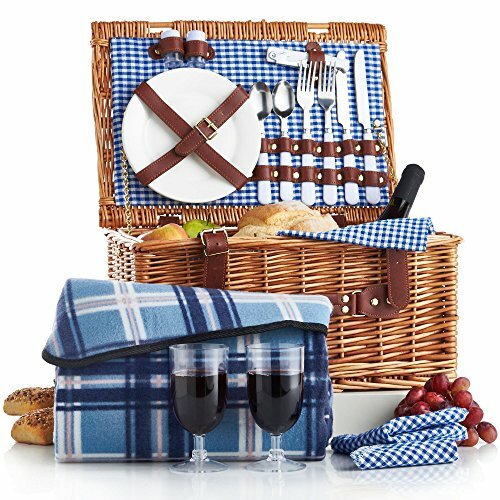 Stocked with all the essentials you need for a classically stylish outdoor feast for two, the basket is perfect for romantic picnics and fun days out. All accessories are kept in place using PU leather straps to prevent movement or damage during transportation. Also includes a 15.7 x 20.9" approx. soft fleecy blue tartan blanket with waterproof PEVA backing so wet grass won’t put a dampener on your picnic. Inside the basket, you’ll find plenty of room for all your favourite picnic treats; sandwiches, cold meats, olives, cheese, fruit, cakes, crisps and drinks. As stylish as it is practical, the basket features a chic white and blue checked pattern cotton inner lining and strong brown wicker construction with PU leather carry handles - making it a reliable and timeless choice for all ages and genders. Basket size: L 15.7" x W 11" x D 7.9" approx.